Nestled between undulating landscapes and ravines of the Southern Free State, Otterskloof Private Game Reserve spans some 14,000 hectares (34,500 acres) on elevated plains, with majestic koppies (hills) arising from the charming yet harsh and rugged African Bushveld, captivating the most discerning visitor. Otterskloof is by all accounts unrivalled in it’s appeal as one of Southern Africa’s premier hunting destinations. The Reserve is privileged to have the Lake Vanderkloof extending its 25km (15,5 miles) Western Boundary. Otterskloof is a game reserve of outstanding scenic beauty situated in the Free State, Karoo. The reserve is run along pure, sustainable management and development principles with an exceptionally low development and tourist footprint offering unrivalled exclusivity and privacy. Family owned Otterskloof offers guests incredible ecological diversity in a “Conservation First” reserve, where all guest income goes towards positive conservation efforts. It offers guests unique wildlife experiences, thrilling activities and picturesque natural assets in abundance. There is a unique programme of activities such as swimming, hiking, game drives, fishing (own fish gear), veld braais, sunset drives and Bush dinners (weather permitting) for guests to tailor-make their stay. Otterskloof is a family friendly establishment. Sweeping across 30 000 acres of bush veld savannah, river, valley and magic mountain landscapes, Otterskloof represents a piece of Africa as it used to be with the mighty Knapsak river, Vanderkloof Dam, weaving through breath taking landscapes. entrusted to us for generations to come." Otterskloof Private Game Reserve is an Afristay Valued Member. 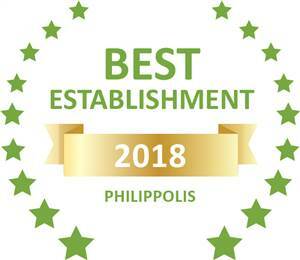 Based on reviews of establishments, Otterskloof Private Game Reserve has been voted Best Establishment in Philippolis for 2018.